Paratrooper William John McLean II died on his son's second birthday. William McLean III is now 70. 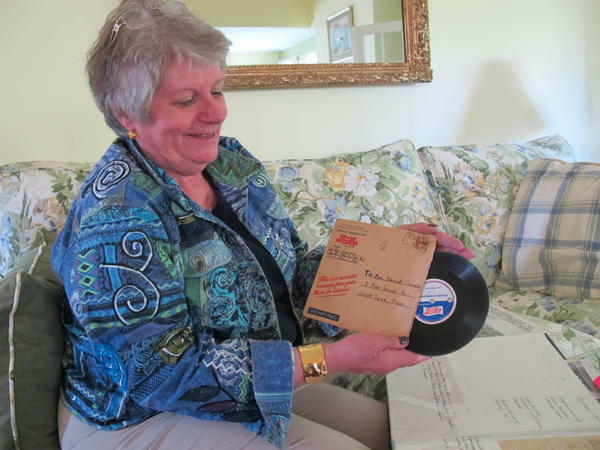 As a child, Geraldine Conway Morenski would listen to her father's voice on a wax recording from 1944. Army Cpl. David Leonard Conway's grave is in the Netherlands. His daughter has visited several times with other war orphans. 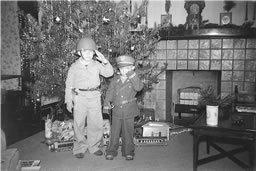 Walter Carter and his older brother salute their father, an Army doctor in World War II, in front of their Christmas tree in 1943. Memorial Day commemorates those who died serving in the U.S. Armed Forces. For some Americans, the day revives their few and fading memories of their fallen fathers. 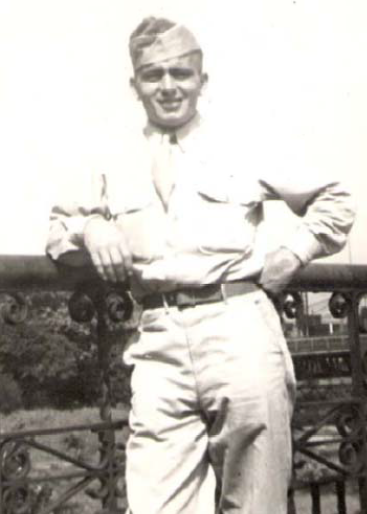 Those who lost a father in World War II are considered "war orphans." These are the stories of three of those children who have lived nearly all their lives without their dads. Geraldine Conway Morenski holds onto a few distant memories of her dad: picking her up out of her crib, laughing, playing with her in the backyard. She was just 2 years old when Army Cpl. 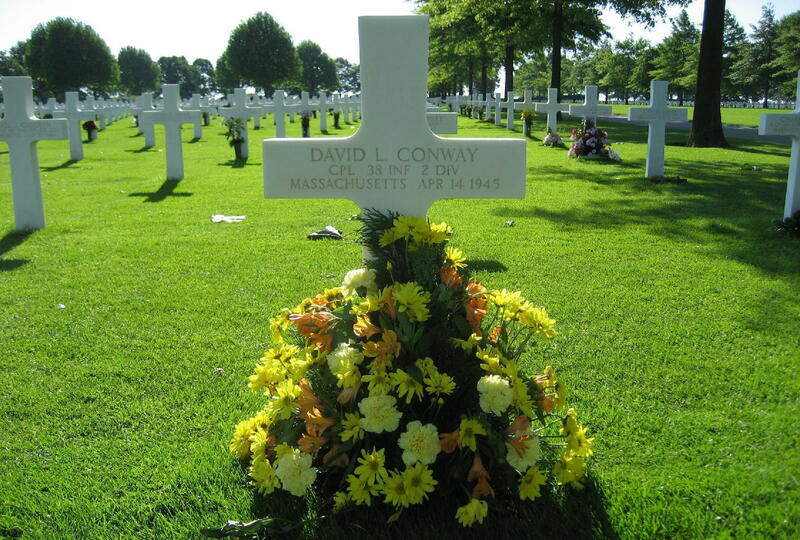 David Leonard Conway was killed in Germany, just before the end of the war. But at 71, she knows what he sounded like, thanks to a worn wax recording from 1944. "Growing up, my mom would play this record ... and she wanted me to hear his voice," she says. "My dad was an angel in heaven. And so I was hearing an angel talk, when I was 4 or 5 years old. As I got older, of course, that image went away." As Morenski grew up, she had more questions. But her mom, who never remarried, didn't want to answer them. "She got a look. There was a look in her eyes. And as a child, you didn't want to make your mother sad. So you didn't ask the question," she says. Morenski says many children back then never really learned how to grieve. In 1985, she traveled to see her father's grave at the U.S. military cemetery in the Netherlands, a grave marked by a white marble cross. "It was the period at the end of the sentence. It was something to touch, with his name on it," she says. Morenski's been back several times, often on Memorial Day with other World War II orphans. Seeing her father remembered there gives her solace. "He died doing something that these people still appreciate. And that's a good thing," she says. "That's a good thing to grow with." To celebrate Memorial Day in first grade, William John McLean III was asked to bring mementos from the war. He grew up without any memories of his father. But he remembers taking his dad's medals to school, including the Purple Heart for the wound that killed Army paratrooper William John McLean II in Germany. "In those days, we walked home to lunch, it was a neighborhood school. And I went home, and my mom asked how it had all gone. And I burst out in tears," he says. His mother asked why he was crying, and McLean remembers answering, "Because Daddy died." McLean says he learned to be proud on Memorial Day. He says he has always understood the necessity of his father's sacrifice, though the price is still felt. "My dad was killed on my second birthday. And I just celebrated my 70th. Every year that I celebrate that birthday — and I hope I celebrate many more — will be one more year in which he was not a part of my life," he says. Another war orphan, Walter Carter, has been living without his Army doctor father, Capt. Norval Carter, since 1944. Half a century later, Carter found a trove of his dad's letters in his mother's attic. In one of them, there's a snapshot of two toddlers in front of a Christmas tree, stubby arms raised in salute. "I don't remember having that picture taken of my brother and I saluting him," Carter says. "But after my mother sent it to him, he wrote back, asking, 'Why are they saluting with their left hands?' "
In 1997, Carter went to the field in France, where a German sniper shot his father on June 17, 1944. "[I] laid a bouquet of flowers on the spot where my father fell. It was like attending my father's funeral, 50-some years after his death," he says. Carter's not sure he'll ever get closure. But at age 73, and with another Memorial Day without his dad, he says he's moving closer to it. Copyright 2017 WBUR. To see more, visit WBUR. Tomorrow is Memorial Day, when we commemorate those who died serving in the U.S. Armed Forces. Today, we have a story of three people whose fathers died many years ago. These World War II orphans, as they're known, have lived nearly all their lives without their dads. Curt Nickisch of member station WBUR in Boston introduces us. CURT NICKISCH, BYLINE: Geraldine Conway Morenski holds onto a few distant memories of her dad: picking her up out of her crib, laughing, playing with her in the backyard. She was just two years old when Army Corporal David Leonard Conway was killed in Germany just before the end of the war. But at 71, she knows what he sounded like, thanks to a worn wax recording from 1944. GERALDINE CONWAY MORENSKI: Growing up, my mom would play this record. CORPORAL DAVID LEONARD CONWAY: Hello, OK.
GERALDINE'S MOM: This is your father's voice. MORENSKI: And she wanted me to hear his voice. CONWAY: And this is kind of a novel idea, a novel way to wish you a Merry Christmas, in the event that I don't get home. MORENSKI: My dad was an angel in heaven, and so I was hearing an angel talk when I was four or five years old. As I got older, of course, that image went away. NICKISCH: As she got older, she got more questions, but her mom, who never remarried, didn't want to answer them. MORENSKI: She got a look. There was a look in her eyes. And as a child, you didn't want to make your mother sad. So, you didn't ask the question. NICKISCH: Morenski says many children back then never really learned how to grieve. In 1985, she travelled to see her father's grave at the U.S. military cemetery in the Netherlands, a grave marked by a white marble cross. MORENSKI: It was the period at the end of the sentence. It was something to touch with his name on it. NICKISCH: Morenski's been back several times, often on Memorial Day with other World War II orphans - that's the government term for them. Seeing her father remembered there gives her solace. MORENSKI: He died doing something that these people still appreciate. And that's a good thing. That's a good thing to grow with. WILLIAM JOHN MCLEAN III: As a first-grade student, there was the celebration of Memorial Day, and we little kids were asked to bring in any mementoes from the war. NICKISCH: William John McLean III grew up without any memories of his father. But he remembers taking his dad's medals to school, including the Purple Heart for the wound that killed army paratrooper William John McLean II in Germany. III: In those days, we walked home to lunch. It was a neighborhood school. And I went my home and my mom asked how it had all gone. And I burst out in tears. I remember saying to her, when she said why are you crying, because Daddy died. NICKISCH: McLean says he learned to be proud on Memorial Day. He says he's always understood the necessity of his father's sacrifice, even though the price is still felt. III: My dad was killed on my second birthday. And I just celebrated my 70th. Every year that I celebrate that birthday - and I hope I celebrate many more - will be one more year in which he was not a part of my life. NICKISCH: Another war orphan, Walter Carter, has been living without his father since 1944. Half a century later, Carter found a trove of his dad's letters in his mother's attic. In one of them, there's a snapshot of two toddlers in front of a Christmas tree, stubby arms raised in salute. WALTER CARTER: I don't remember having that picture taken of my brother and I saluting him. But after my mother sent it to him, he wrote back, asking why are they saluting with their left hands? NICKISCH: In 1997, Carter went to the field in France, where a German sniper shot his army doctor father, Captain Norval Carter, on June 17, 1944. CARTER: Laid a bouquet of flowers on the spot where my father fell. It was like attending my father's funeral, you know, 50-some years after his death. NICKISCH: Walter Carter's not sure he'll ever get closure. But at age 73, and with another Memorial Day without his dad, he says he's moving closer to it. For NPR News, I'm Curt Nickisch. MARTIN: And you're listening to WEEKEND EDITION from NPR News. Transcript provided by NPR, Copyright NPR.